A haunting story of a family's flight from danger to a new life in a new country. Azzi and her parents are in danger. They have to leave their home and escape to another country on a frightening journey by car and boat. In the new country they must learn to speak a new language, find a new home and Azzi must start a new school. With a kind helper at the school, Azzi begins to learn English and understand that she is not the only one who has had to flee her home. She makes a new friend, and with courage and resourcefulness, begins to adapt to her new life. But Grandma has been left behind and Azzi misses her more than anything. Will Azzi ever see her grandma again? 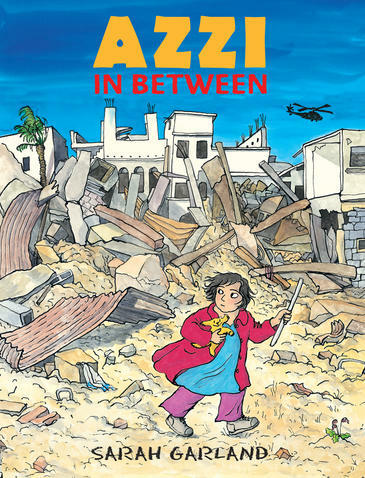 Drawing on her own experience of working among refugee families, renowned author and illustrator Sarah Garland tells, with tenderness and humour, an exciting adventure story to be enjoyed by readers of all ages. Endorsed by Amnesty International. 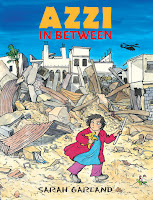 This is the first of three books I will be sharing this week that all deal with children and war. I am not sure where this picture book fits. The story is told in a comic strip style, but it probably wouldn't be considered a graphic novel because of it's format (hardback and picture book sized). There are a lot of reasons why I think this format works for this story, and one of those reasons is the information we get from the illustrations. The obvious differences in the lifestyle lead by the family can be seen clearly through these two images below. The first picture, of the family packing up their belongings, and the second (later in the book), shows that they now live in just one room. This is a story that will resonate many school communities, as many schools around the world have students who come from all over the world, looking for a better (safer) life. While Azzi's journey was difficult, and leaving her grandmother was heartbreaking, starting a new school where she doesn't speak the language and doesn't understand the language would be so frightening. Azzi is lucky enough to have the support of Sabeen, who helps her with her English, with this support comes confidence, and with confidence Azzi begins to enjoy her new life. I like this book, but my only concern is who will read it, and that may depend where it ends up on the library shelf. As I said, it's not a picture book, it's not for the very young, and it probably won't appeal to the traditional graphic novel readers. I think it is a book that teachers and librarians will use ans promote, and hopefully the readers who are interested in this subject will find the book, no matter where it is on the shelf.